Here at MDR, we offer independent commercial property snagging services, designed to ensure that your investment is finished to the highest of standards. No need for awkward interactions with your builders, as we offer the very best, fully detailed snagging reports, and can liaise directly with them on your behalf. Our nationwide commercial snagging inspections and reports are specifically designed for our clients working within the commercial construction sector. With a wealth of experience behind us, our inspections and snagging reports provide a comprehensive overview of the condition of the property prior to occupation. We make detailed notes of any defects or omissions in building works that need rectifying before you complete on your purchase. From new build properties, to commercial premises and office buildings, we can help to ensure that your new property is the best it can be from the outset. Comprehensive, detailed and evidenced commercial inspection reports sent to you within 48 hours. Following our inspection, we will provide you with a completed commercial property inspection report, undertaken from a professional building perspective. Unlike traditional snagging reports, we provide large amounts of details. We take the time to outline and explain all of the technical information regarding the construction of the property, and will highlight any minor or major defects. We will also provide you with a full property inventory for you to review and make comment on. We offer the same service to commercial landlords throughout the UK. Having our independent inspectors compile a complete list of any defects can help to protect your investment in the longer term. Our professional inventory clerks and snagging experts are on hand to offer you our knowledge and experience throughout the term of the let. The cost of using a commercial property inspection company is a minimal outlay when it comes to the quality of your build. We offer tailor-made quotations for our commercial clients, designed to suit your individual requirements and the size of the premise you wish us to inspect. We believe that every new build should undergo a full property snagging inspection. After all, if you are paying for brand new property, you deserve to know that it is built to the highest of standards and worth every penny. Commercial snagging requirements differ from those of residential reports, and our experienced snagging surveyors know what to look for to protect your investment from remedial work further down the line. Why Should You Use A Commercial Property Snagging Company? Because we approach every project in a technical way, we are able to report our findings in a professional and structured manner. Our snagging reports offer a thorough overview of any potential defects for your own peace of mind, as well as to advise your buildings what needs to be done. Commercial property snagging requires a keen eye for detail, and a good understanding of the commercial construction process. From the foundations to the final fixes, our independent commercial snagging inspectors can provide you with an in-depth snagging report for your commercial property. We can identify a wide variety of faults that could have a detrimental effect on your commercial property. These could include subtle faults like leaks or poor quality workmanship, through to larger scale defects like subsidence. Our snagging reports will identify any issues that prevent the property from being both fully functional and aesthetically pleasing. Could Your Commercial Property Benefit From An Independent Snagging Report? Snagging reports are not undertaken to use as a weapon against your builders or construction companies. They are an effective way of ensuring that any problems are repaired or rebuilt prior to exchange of contracts. This means that not only are you, as the buyer, completely satisfied with the finished products, but also that the construction company is continuing to offer high-quality developments. Because developers and construction companies often work to extremely tight deadlines, quality control can sometimes be overlooked. Commercial property snagging inspections are extremely worthwhile and will ensure that as a buyer, you receive the highest level of workmanship for your investment. Commercial Snagging Services – How Can We Help? We understand that you may have questions about how a commercial snagging report could be of benefit to you, as well as what is involved and when the inspection should be undertaken. To help you decide on whether we can be of assistance to you, we have compiled a list of common questions regarding commercial property inspections and snagging. Unlike traditional structural surveys, snagging surveys are designed to pick up everything from minor issues, to more serious, structural problems. Your developers should then fix any issues prior to completion of the purchase. 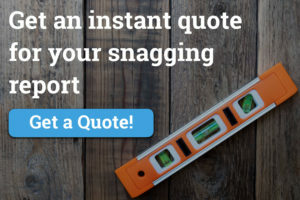 Our snagging reports will note every single aspect of the build that does not meet the required standards, and can liaise directly with your builders to make them aware. Our Commercial Snagging Inspections usually take between 3-6 hours and will be undertaken by one of our professional snagging surveying team. They will check every aspect of the property, from the flooring, walls and communal areas, to bathrooms and kitchens as well as the supply of services to the property. When Will I Receive My Commercial Snagging Report? We aim to provide you with a full and comprehensive report within 48 hours of the inspection being undertaken. Our independent surveyors will send you with a detailed and evidenced report that will provide the developer with all the information they need to make sure your purchase is perfect prior to completion. How Much Will My Commercial Snagging Report Cost? We provide residential snagging reports from as little as £199. For commercial snagging inspection services, we tailor our prices to fit the individual needs of the client and the size of the property. Please contact us for a bespoke quote to suit your requirements. What Does A Snagging Report Include? Our comprehensive snagging reports include detailed and evidenced findings that relate to defects in the property. We will inspect all internal areas of the premises, and some external ones too. We will seek to identify minor defects like leaks or poor joinery work, as well as more serious defects like subsidence of poor construction work. Can You Help Me To Liaise With The Construction Company Or Developers? Yes! We offer a full project management service which enables us to oversee every aspect of the remedial work. We will lease directly with your construction company or developers, and ensure that your commercial property is finished to the highest standard. When Should I Book My Commercial Snagging Report For? Ideally, your report should be undertaken prior to completion and occupation of the property. In reality though, snagging inspections and reports can be carried out anytime within 2 years of the completion of the build. Speak to our helpful and friendly team today to receive your tailor-made quote.